Xingbo Liu is a 6th Duan Chinese Martial Arts Master who trained in the Shaolin Temple, in China. Xingbo Liu was born in Jilin City, China. He’s given Shaolin name is Shi Heng Nan. He has been studying martial arts since he was 6 years old. He was 9 years old when he became pupil to Liu Xing Zhen, a martial arts expert of Shandong Province, China. At the age of 13, he continued his martial arts training with Shi Guo Lin, the chief warrior monk of the Shaolin Temple. 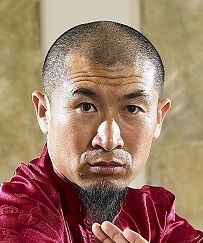 Shi Guo Lin currently lives in Los Angeles, where he founded ‘Shaolin Temple Overseas’. Master Xingbo successfully acquired DaHong quan (Hung Gar Kung Fu), Shaolin style Kung Fu (traditional style), Wushu (modern style), Tai Chi (Yang style) and Qi Gong. At the age of 15 he was enrolled to into the biggest school in China, Shaolin TaGou Martial Arts School to study SanDaBoJi (Chinese Kick Boxing). He took part in several martial arts competitions in the district, the province and the whole country, in which he gained excellent results. By the time he was 18 he started to teach in JiangSu and ShanDong province. Master Xingbo trained many excellent martial artists, who won several competitions. In 1998 Master Xingbo moved back to his home city, Jilin, where he opened ‘Jiang Nan’ Martial Arts School. In 2000 Master Xingbo was invited to work for the Chinese State Circus as an acrobatic fighting actor. In November 2001, The Chinese State Circus began touring performances in the UK which lasted for over two years. During these performances, the troupe was warmly received by many audiences and their performances made a contribution to educating people about the ancient Chinese Cultural heritage of Chinese Martial Arts. Master Xingbo is member of several associations, British Council for Chinese Martial Arts, Jilin Province Martial Arts Association and China National Martial Arts Association. Master Xingbo is a China National Secondary Grade Martial Arts Judge, a sixth stage player of China Martial Art San Shou and an exponent of Chinese Shaolin Gong Fu (Acrobatic Fighting). In 2005, he has established China Spirit UK, a Chinese Cultural, Health and Well-being Centre, based on Merseyside.